Officials at Sandals Resorts International (SRI) have found a unique way to mark this week’s 70th birthday of Jamaican musical icon Bob Marley. 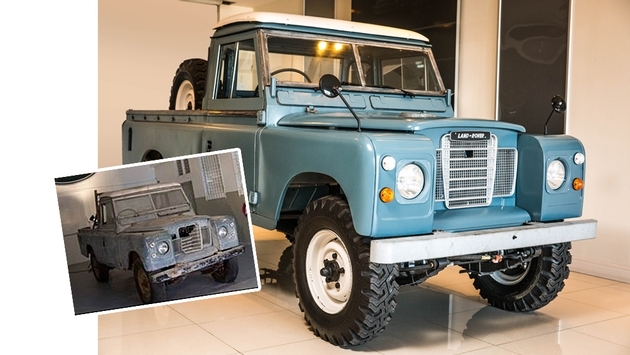 The company has successfully restored the late legend’s Marley’s matte-blue 1977 Series III Land Rover. SRI officials have returned the Land Rover to Marley’s former home at 56 Hope Road in Kingston, which is today a museum dedicated to his memory. The restored vehicle “will be unveiled in grand fashion at a Reggae concert,” according to SRI officials, and featured at a variety of events around the island in 2015. During his days as the world’s most popular reggae artist, Marley was regularly seen driving the Land Rover around Kingston. The city reportedly inspired many of his numerous hits songs including “No Woman, No Cry,” “Three Little Birds,” and “I Shot the Sheriff.” Marley regularly used the Land Rover to transport his band, The Wailers, and their equipment to performances across Jamaica. Workers restored the battered, non-running vehicle by first dismantling it piece-by-piece. They then carefully restored the chassis, drive and power trains to full working condition. The Land Rover’s body panels were then returned to their original condition and in some cases replaced, and the vehicle also received a complete electrical rewiring and replacement of all electrical components. The new engine is from an African military vehicle workers call a “perfect” match with the Land Rover’s original engine. “It is a tremendous honor to help return such an extraordinary automobile to its former glory,” said Adam Stewart, CEO of SRI and ATL Automotive.